Sometimes it’s obvious what something is, and you don’t need a label. Other times it’s not so obvious, and you do need a label. Then there’s the rare instance when it’s obvious what something is, but someone feels compelled to supply a label anyway. That third scenario is what I saw when I went to my daughter’s volleyball tournament last weekend and snapped this photo of a cabinet in the lobby. 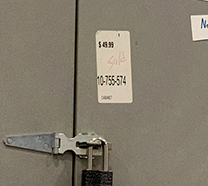 The label is small, but if you look closely, you’ll see that it helpfully declares the item to be a “cabinet.” It further announces, in red handwriting, that the item has been “sold,” thereby allaying my concerns that my daughter was spending her Saturday playing volleyball in a den of cabinet thieves. The second scenario – label needed – is the focus of this Alert. And the territory is familiar ground ‒ joint employment. It’s rarely obvious what that phrase means, and companies that use workers supplied by other companies have been seeking clarity for some time now. Ignoring Ronald Reagan’s famous quip about the nine most terrifying words in the English language, the Department of Labor (DOL) announced on Monday that it’s here to help. Aiming to provide that much-needed clarity, the Wage and Hour Division of the DOL has proposed a new regulation that would redefine “joint employment” under the Fair Labor Standards Act (FLSA). Since 1958, the FLSA regulations have unhelpfully suggested that two companies may be joint employers if they are “not completely disassociated” from each other. In recent years, that excessively broad language has been used by some courts to label companies “joint employers” under circumstances where the DOL no longer believes the tag is warranted. Otherwise acting directly or indirectly in the interest of the employer in relation to the employee. The joint employment test would not look to whether the worker is economically dependent on the putative joint employer. Economic dependence is still relevant to whether a worker is an employee of the primary employer but, under the proposed new regulation, it would no longer be relevant to the joint employment analysis. The new rule would also clarify that certain business models are not lightning rods for joint employment. For example, franchising would not increase the likelihood of a joint employment finding. The new rule would provide that certain types of business agreements are not indicative of joint employment. For example, requiring an employer to institute workplace safety measures, wage floors, sexual harassment policies, morality clauses, or requirements to comply with the law or promote other desired business practices would not be evidence in favor of joint employment. The proposed new regulation will now proceed down the path labeled, Notice of Proposed Rulemaking. In the next few days, the Notice will be published in the Federal Register. That publication will begin a 60-day public comment period. Anyone can submit comments. Really, I mean anyone. Comments about the proposed rule may be submitted electronically at www.regulations.gov, in the rulemaking docket RIN 1235-AA26. Notice of Proposed Rulemaking is a potentially bumpy path, with cobblestones and potholes along the way. Based on the comments, the DOL could decide to modify the proposed rule or rewrite it or scrap it entirely. But hopefully, if things turn out right for the business community, at the end of that road there is a tall beige cabinet with a label on it that says “cabinet,” and inside that cabinet is a newly minted regulation that says “joint employer” and, for the first time in decades, everyone will know what that means.